Now that the dust has settled and I am ready to comment on what I saw Sunday, I hope the Steelers take some lessons from this game that will help them reach the playoffs. The amazing thing is that the Pittsburgh Steelers did escape with a 13-9 win over the Kansas City Chiefs. The highly favored Steelers who barely got out of Arrowhead with a victory, find themselves tied again with the Baltimore Ravens at 8-3 on top the AFC North conference. With dropped passes by Heath Miller and Mike Wallace, a costly interception by Ben Roethlisberger and a lack-lustre performance by one of the top defenses in the NFL, they still won! The offense started out fine and it looked like Pittsburgh was going to steam roll the Chiefs. But, with the above mistakes and some stupid penalties thrown in, the outcome was in doubt the whole 2nd half. The usually dependable Steelers defense lost it's energy when all pro strong safety, Troy Polamalu went out with concussion symptoms on an ill-advise head first tackle. After that, it was like the air went out of them and they reverted to a very base and conservative defense. The defense did have 4 take aways and help preserve the victory. Even though this bad win is still a win, it could be costly if Polamalu is lost, even for one game. With the 7-4 Cincinnati Bengals and the 9-1 San Francisco 49ers next on their schedule, the Steelers will have to perform at a much higher level. Getting Polamalu and Lamarr Woodley back will greatly improve their chances and victories over those two teams could solidify a playoff berth. Improvements on offense and defense are the order of the day. Steeler fans hope to see a better game next week. Remember Tomlin, time is running out! Thumbs Up For Ben Roethlisbeger,He's Tough! Ben Roethlisberger did not miss a snap as the Pittsburgh Steelers advanced to 7-3. He completed 7 of 11 pass attempts for 70 yards in the 2nd half, which included a perfect 4-for-4 during the game-winning drive in the 3rd quarter. Big Ben seriously injured the thumb on his passing hand at some point during Pittsburgh’s 24-17 win over the Cincinnati Bengals on Sunday. He is not certain just when it occurred, only that he recognized it while coming out for the 2nd half. “It hurt, but Steelers head trainer John Norwig did a great job taping it up, making a quick splint out of tape so I could go on it. ” Roethlisberger said. “Squeezing the ball is the hardest part, but it’s a good thing that I had a glove on it because that helps gripping it a little bit. ” “It was hard to determine it on the sideline, but we did all the tests Monday, and it’s fractured in there, ” Ben said. This is not the 1st time Big Ben has performed with a broken thumb. 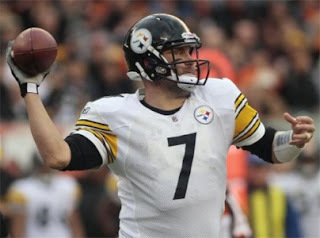 He experienced a similar injury in 2005, even though it did not stop him from leading the Pittsburgh Steelers to their 5th Super Bowl championship. There ought to be no problems this time either, though Roethlisberger will continue to play with a splint. Pittsburgh journeys to the Kansas City Chiefs on Nov. 27. It is not uncommon for Ben Roethlisberger to play with minor injuries. He experienced a sprained foot in a loss to The Houston Texans on Oct. 2nd then tied a team record with 5 TD passes in a win over The Tennessee Titans. “That’s just Ben, ” Mike Wallace said. “You know that something small isn’t going to slow him down like that. ”. Pittsburgh Steelers Back On Top! The Pittsburgh Steelers beat the Cincinnati Bengals 24-17 in their first meeting this season. The 6-3 Bengals competed all game long and the Steelers had to work hard to secure the win. The best thing about the win is that it helps to erase the pain of losing the 2nd time to their other division rivals, the 6-3 Baltimore Ravens. The AFC North is the only division in the NFL with three teams having at least 3 wins half way through the season. Right now the Steelers are on top. The Steelers have one more win than the other two team because they haven't had a bye week yet. Ironically the Steelers will have their bye week this week while Baltimore and Cincinnati play each other. That game could determine which team is on top when the Steelers return. The bye week couldn't come at a better time for the Steelers. With a tough schedule ahead and players needing time to mend, it's just what the doctor ordered. Hines Ward, Ben Roethlisbereger and Lamarr Woodley along with some offensive linemen could really use the time off. Nagging injuries and two emotional games in a row have really taken a toll. Get well Steelers, see you next game. There's no doubt that the Pittsburgh Steelers 23-20 loss to the Baltimore Ravens hurts. The Ravens now control the AFC North with 2 wins over the Steelers. The good thing is that the Steelers hung with the Ravens this time. Their first meeting resulted in a 35-7 pounding by Baltimore that could have been discouraging to any but a veteran team. The Steelers slid to third place in the division, but playoff hopes are still alive. The (6-3) Pittsburgh Steelers are behind Baltimore (6-2) and the Cincinnati Bengals (6-2) and will meet the Bengals this week before going on a bye. The remaing games are 2 with Cincinnati, 2 with the (3-5) Cleveland Browns, the (4-4) Kansas City Cheifs, the (7-1) San Francisco 49ers and the 1-7 St. Louis Rams. If they win at least 5 of those 7 games, they could still make the playoffs. If they win all of them, there's a chance to win the division. I'll admit that there are some tough games ahead. But this team has been able to put together winning streaks in the past that took them all the way to the Super Bowl. Because of having their bye week late in the season, the Steelers wil get some much needed rest and a chance for some players to get back into action. This loss to the Ravens was bad, but it could have been a whole lot worse. The season is not over yet. This is just the start of the 2nd season. Steelers Win! Experts and Patriots Lose! Almost all the so called experts had the Pittsburgh Steelers going down in defeat to Tom Brady and the New England Patriots. Not so fast my friend, you have to play the game. And that's just what the Steelers did as they went on to win 25-17. They beat Bill Belichick and the Patriots at their own game. Mike Tomlin and his coaching staff out coached the great mastermind on both sides of the football. Offensively Ben Roethlisberger looked like Tom Brady, throwing 50 times for 365 yards. That's almost unheard of from a Steelers team. “We can be as good as we want to be,” Roethlisberger said. “When we don’t kill ourselves and stop ourselves, we can be pretty dangerous.” Tom Brady on the other hand, was held to under 200 yards passing. “We all have to individually look in the mirror and figure out what we need to get better at,” Brady said. The Steelers looked great on defense too. Before Lamarr Woodley got injured , he sacked Brady twice. Instead of their traditional zone defense, the Steelers played man 70% of the time. This switch confused Brady and disrupted the receiver's routes. With Troy Polamalu flying around and the rest of the defense playing up to their talent, the steelers looked good going into next week's rematch with the Baltimore Ravens. The Pittsburgh remains on top the NFL AFC North division at 6-2.